Col. McFerran supervised the construction of the old stone jail in the northwest corner of the public square in Gallatin. It was planned in 1856 and completed for use on Nov. 15, 1858, at a cost of $3,300. Research of the courthouse records (1885-1888) reveals much about the actions to develop the then new “squirrel cage” jail of 1888. Starting in the minutes of the county court (Book H, page 400), on April 8, 1885 the county reported an order to Thomas B. Yates, William M. Bostaph and A.M. Irving to act as a committee to view plans and specifications to build a new jail. They were also to propose plans to remove the old jail structure from the public square. The committee was to report back on May 1. On June 2 the committee estimated that by using materials salvaged from the old jail, and procuring a proper place, a new jail with iron cells — complete with residence quarters for a jailer — would cost about $7,300. The county court took these results under advisement. On Aug. 4, 1885, a petition signed by 264 persons requested an election to vote on a new courthouse and jail. The old buildings had been condemned by a grand jury. The new structures were to be financed by $50,000 in 6% bonds. The election held Oct. 6, 1885, however, failed to gain majority approval for the new construction. On Monday, Feb. 1, 1886, another petition signed by 168 persons called for a new jail since the old one had been consumed by fire. The funds were to be by special tax of 20-cents per $100 on real and personal property. The election on March 23, 1886, approved the development. On April 6, 1886, James F. Nelland was appointed to oversee the removal of the old jail material and move it to the northwest corner of the William Richards Block. The old privy, which cost $250 in 1859, was to be moved west across the street and off the courthouse square. Neeland was paid $51.30 for his work, and the county court rented the middle cell of the Calaboose (city jail) for six months as a common jail of the court at the rate of $50. On Tuesday, Dec. 7, 1887, the court ordered A.M. Irving to act as a special commissioner to supervise planning a suitable jail, to make estimates, to submit pleas, and to report back to the court by Jan. 25. Irving was discharged but reappointed to supervise the erection of the new jail and jailer’s quarters. Again, he was to submit plans and to estimate costs. Irving’s report given Feb. 8 called for a “rotary cell” jail as built by the Pauley Jail Company of St. Louis. The jail and residence was estimated to cost $11,000. Irving proposed that the plan would provide better protection for the sheriff in handling prisoners, better lighting, better ventilation, more security from fire, and better sanitary arrangements. Another system of cell rooms, equal in safety for the detention of prisoners in square cells, would cost about $1,000 less to build. 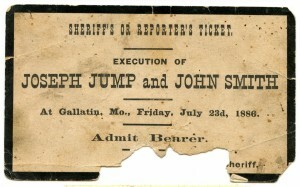 The court accepted the report on March 1, 1887, and ordered the jail built on land donated by the City of Gallatin on part of the Richards Block. Plans were reviewed again on March 9 and on March 21. The court approved the effort, ordering first payment of $6,000 when the building was completed and received. Interest at 8% was to be paid on the balance, which was to be paid off in a reasonable time. On May 3, 1887, Dekalb County Sheriff James Gibson was paid boarding fees for our county prisoners amounting to $85.60. The court also rented the J.W. Alexander Building for court use at $500 per year on that day. On Monday, Dec. 3, 1888, Irving was paid for his work, an amount totaling $350, and was discharged. His report of costs on the new jail and jailer’s residence totaled $11,261.15 and was approved by the officers of the county court. Written by David Stark, Gallatin, October, 1994.